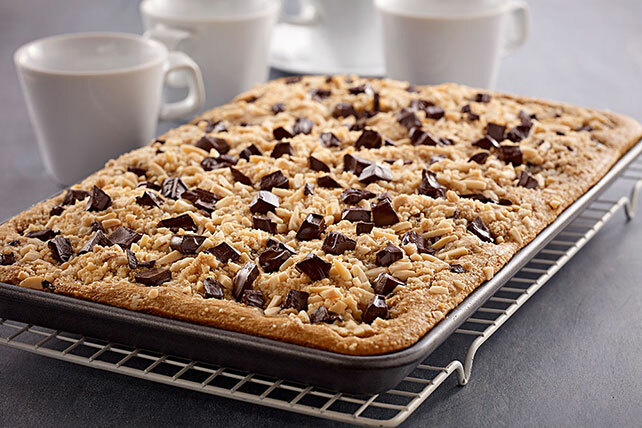 Try Chocolate-Streusel Coffee Cake with chocolate chunks, slivered almonds & freshly brewed coffee. Chocolate-Streusel Coffee Cake is a nice morning treat. Combine flour and sugar in medium bowl. Cut in butter with pastry blender or 2 knives until mixture resembles coarse crumbs. Stir in nuts. Prepare cake batter as directed on package, substituting the brewed coffee for the water. Pour into 15x10x1-inch pan sprayed with cooking spray; sprinkle with half the chocolate. Top with nut mixture and remaining chocolate. Bake 20 to 25 min. or until toothpick inserted in center comes out clean. Cool completely. Melt 2 oz. additional BAKER'S Semi-Sweet Chocolate as directed on package. Drizzle over cooled coffee cake; let stand until chocolate is firm.